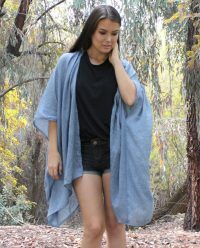 Oversized Chambray boho kimono coverup. Comfortable with an easy going yet stylish look. It goes great with shorts, leggings, jeans, mini-dress, or as a coverup over bathing suits. 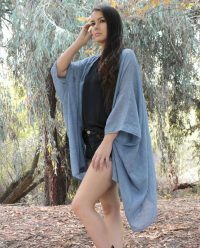 This oversized open front kimono coverup is loose fitting with lots of movement; comfortable with an effortless yet stylish look. It goes great with shorts, leggings, jeans, mini-dress, or as a coverup over bathing suits. Yes, it’s a piece you can wear anywhere and enjoy year round. Fabric: 100% Lightweight Cotton. Pre-washed, pre-shrunk, and handmade in the USA.